A new feature adds a boatload of facts relating to movies and TV shows. When Amazon unveiled its Fire TV streaming video box a year ago, its big defining feature was the ability to search by talking into its remote control. But with gadgets, yesterday’s defining feature has a way of turning into today’s checklist item. Last week, Roku introduced a new version of its Roku 3 box that lets you…search by talking into its remote control. Now Amazon is rolling out a new version of the software for the $99 Fire TV and $39 Fire TV Stick which, once again, gives them a capability not available on Roku and other rivals. That’s X-Ray, a form of interactive annotations that tell you about the actors, characters, and music in movies and TV shows available via Amazon Instant Video. X-Ray originated as a feature in the company’s Kindle e-readers in 2011 and then showed up for movies and TV on its Fire tablets in 2012. The movie and TV version is powered by IMDb, which Amazon has owned since 1998. 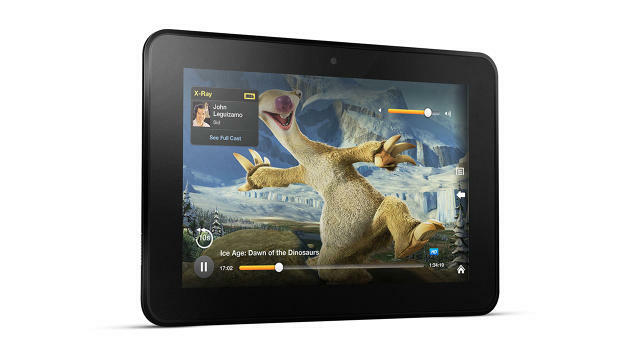 Until now, you’ve been able to use it on a Fire tablet while watching video on a TV equipped with Fire TV. But now, the same information is built into the standalone Fire TV experience. When a film or episode is X-Ray-enabled, pressing pause or the up button brings up an overlay of X-Ray information; pressing the up button again puts X-Ray into full-screen mode. You can browse around to view trivia; jump to other productions which actors in the scene have appeared in, along with their biographies; review background information on characters; and identify songs. You can also navigate the movie or show by jumping from scene to scene. Even classics such as Dr. Strangelove don’t have X-Ray. All of this is assuming that whatever you’re watching has X-Ray info at all. Amazon is a bit cagey about how many movies and shows it’s enabled, saying only that it’s “tens of thousands,” and that the company focuses on the most-watched items. The process of weaving X-Ray data into a production involves both machine learning and human eyes and ears, so the company can’t just flip a switch to make it happen. Judging from the time I spent with a pre-release version of the new feature on a Fire TV box, you can assume that X-Ray is available for Amazon’s own original series (such as Transparent) and for recent, high-profile productions. But when I looked for it among the movies I’ve bought from Amazon–many of which are 30, 40, or more years old–X-Ray was scarce. Even classics such as Dr. Strangelove didn’t have it–at least yet. X-Ray isn’t a game changer, but it is a worthwhile feature that Roku, Apple TV, and other competitors will be hard-pressed to match, since it’s so dependent on the trove of information in Amazon’s own IMDb. And it ensures that even though Amazon Instant Video is available on a bevy of devices–including Roku–it’s the Fire TV version that offers the richest, most fully Amazonian experience.